Eggplant Parmesan is one of my favorite dishes when I want to go meatless. Not convinced that a meatless meal can be a hearty meal? I would urge you to give eggplant parmesan a try. I have to say that eggplant parmesan may not be the quickest dish to make, but I promise the results are better than most of the eggplant you get out a restaurant. 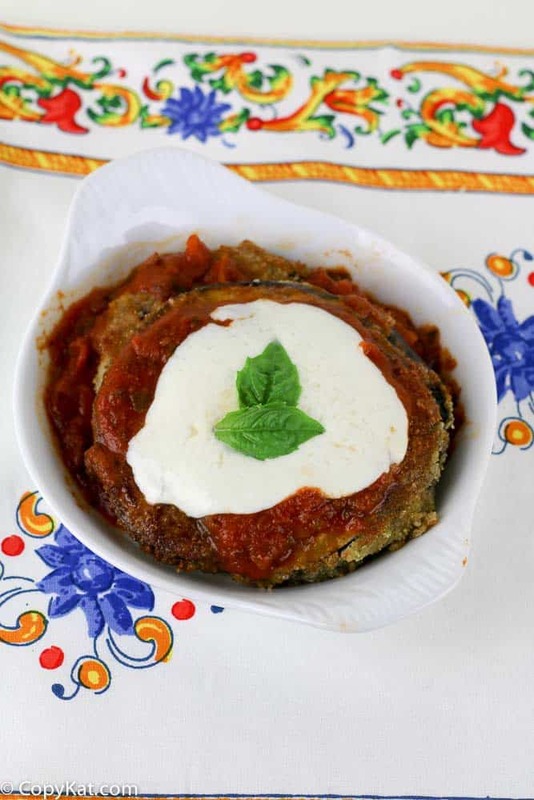 Give this recipe a try, and I promise you will want to make eggplant parmesan often. Sometimes when you order this dish from a restaurant it is soggy, but yours won’t be soggy. We are going to slice our eggplant here and then salt it and wait a few minutes to let the salt help pull the excess water from the eggplant so we will have eggplant that isn’t soggy. After the water pools up on the eggplant you will need to blot off the excess with a paper towel to remove the excess water, and more importantly the excess salt. I am using breadcrumbs for this recipe to coat the eggplant. I like to use the homemade variety, but store bought will also work just fine. When I cook up the eggplant, I sometimes cook a few extra pieces, and allow them to cool, and store them without the sauce. This way when I reheat the eggplant another evening it will be more crisp and less soggy when I reheat the eggplant. After I cook the eggplant I like to let it rest on a wire rack. I think it drains of better on a wire rack than paper towels. To me, if you put it on paper towels the bottom side can steam with the heat of the food. The wire rack allows the eggplant to simply drain leaving both sides crispy. No matter how you do it, you can make a delicious eggplant Parmesan that will rival any restaurant’s recipe. Eggplant Parmesan is a well-known Italian dish. Eggplant is fried crispy and served with marinara sauce. Wash and slice the eggplant into 3/8 inch slices. Sprinkle salt over the sliced eggplant on both sides. Allow eggplant to rest for about an hour to let the excess water in the eggplant to be pulled out via the salt. Pat eggplant dry with paper towels at the end of the hour to remove excess water and salt. While eggplant is resting you can make the sauce. In a medium-size saucepan over medium heat combine oil, onions, and garlic. Cook until the onions have become translucent. Add stewed tomatoes and Italian seasoning and stir. Reduce heat to low and allow to simmer. Preheat oven to 375 and begin breading eggplant. Create an egg wash by whisking together 3 eggs. Dropped sliced eggplant into the egg wash, then flour, and place on a wire rack for it to "dry". Once you have placed the flour layer on the eggplant, repeat with another coating of egg wash, and then dredge in breadcrumbs. Place the breaded eggplant back on the wire rack. Cook eggplant by placing about 1/4 cup of cooking oil in the bottom of a large skillet over medium-high heat. Place eggplant a few at a time in the skillet. Be careful not to overcrowd the eggplant. Cook for a couple of minutes on each side, cook until golden brown on both sides. Allow eggplant to drain on a wire rack. Place cooked eggplant in a baking dish, top each piece of eggplant with some Parmesan cheese. Ladle some sauce over each piece of eggplant. If you have plenty of eggplant you may want to make another layer of eggplant, Parmesan cheese, and sauce. Top with Mozzarella cheese and then bake until the cheese has melted. What is your favorite Italian style dish? If you wanted to email me, why didn’t you just hit me up on my contact page?